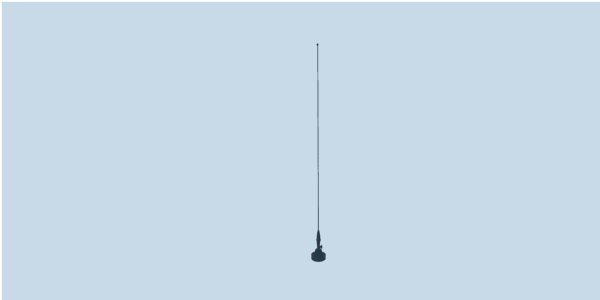 AD-27/V190-3108 is a short omnidirectional monopole wideband antenna for vehicle and fixed-site operation from 30 MHz to 108 MHz with power handling of 100 W. Four versions are available with the addition of a tilting base and/or GPS module. AD-27/V190-3108 is a small wideband monopole antenna intended for VHF frequency range from 30 to 108 MHz. The antenna is intended for use on heavy or light military vehicles. It is designed for maximum gain with acceptably low VSWR for such an extremely short radiating element. The base is made of aluminum and durable plastic materials, with matching circuitry inside and (optional) GPS antenna. A stainless steel spring absorbs shocks and vibrations, while protecting the antenna against impacts. Four mounting holes are equally spaced on a 4.5" (114.3 mm) circle, complying with the USA and NATO standard.